Not too long ago, I went to a friend's house here in Northern California for a wine tasting. The host had already put the wines, which ranged from $12 to $200 a bottle, into burlap bags  the better to test the palates of the wine-loving guests. Of course, having sipped a lot of wine in your life doesn't necessarily make you an expert. No one had a clue as to what they were drinking. Yes, most of us could distinguish the cheapest bottle of swill from the best one. But beyond that? We may as well have had flannel socks on our tongues for all the good our taste buds did us. Until sampling Dr. Dre's Beats  a set of high-end headphone that go on sale today at Best Buys and Apple stores everywhere  I felt the same way about personal listening devices. And I've been trying out many different kinds lately: in ear, over the ear, wireless, noise-canceling, etc., at a variety of price points. Generally speaking, you get what you pay for, but most people would be hard-pressed, within a specific price range, to pick one brand over another. 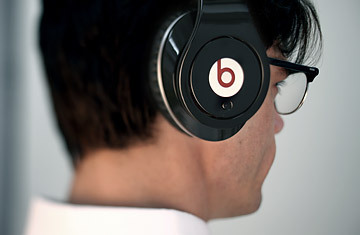 But for $350, you simply can't beat the Beats. You'd have to have thimbles in your ears not to hear the difference between these bad boys and, say, the industry standard in this category, the Bose QuietComfort 3 Acoustic Noise Cancelling Headphones, which list for $349. I put a Y connector into the audio-out jack of my music player and listened to the Beats alongside the 3s. While the bass notes were comparable for both sets of 'phones, it was really the upper ranges where the stylish Beats styled. In fact, the difference was so pronounced that even my wife (who generally identifies music as "that noise" and who sighs dramatically whenever the source of it is shut off) could hear the sweetness. I could hear whole orchestras in the upper frequencies, whereas with the Bose 'phones, the sound was flat and muted. I don't mean to dis the Bose set completely, especially since my family gave it to me  at my request  last Father's Day. Indeed, I got those 'phones for air travel, and their noise-cancelation is superior to the Beats'. That's probably because  though they have some noise-canceling tech built in to them  the Beats are designed to enhance the listener's enjoyment of music rather than drown out the snores of your seatmate. Dre, who for three years collaborated with Jimmy Iovine, chairman of Interscope Geffen A&M Records, and audio "connectivity" company Monster to create the Beats, says his goal was to give people a way to "hear what the artists hear and listen to the music the way they should  the way I do." These are exceptionally stylish headphones, too. That's unusual in the world of audio equipment, where most stuff appears to be designed for old men who wear Hush Puppies. The red-and-black box that the Beats come in is an objet d'art  including drawers and panels like those of the jewelry box your mom got on a trip to Asia  that makes even Apple's uniquely stylish packaging look unimaginative and overly simple. The headphones collapse and fit into a neat, football-sized carrying case. Monster, known for its high-end cables, gives you one standard cable (in red!) and another one (black), which has a mic built in and a button, so you can answer calls to your iPhone. The Beats: just what the doctor ordered.